For the first time in 11 years, two players from Nova Scotia are invited to Hockey Canada’s under-20 world junior selection camp. Centre Shane Bowers, 19, from Herring Cove and defencemen Jared McIsaac, 18, from Truro are going to the camp in Victoria, B.C. from Dec. 10 to 14. There are 34 players invited to the camp and 23 will make the team. “Shane is an unbelievable player and to be able to go with him and compete for a spot is pretty neat,” said McIsaac. Bowers and McIsaac have been rising stars in Nova Scotia for a while. McIsaac was allowed to jump to Nova Scotia’s major midget league a year early, while Bowers led major midget with 23 goals and 52 points his first and only year in the league. This will be Bowers’ only opportunity to make the team. He was not invited to the selection camp last year and will be too old next season. He was a 2017 first round NHL draft pick by the Ottawa Senators, but was traded in November 2017 to Colorado. He is in his second season at Boston University. He was watching football on Sunday with his teammates when he got the call from Hockey Canada telling him about the camp invite. Hockey Nova Scotia’s development director Darren Sutherland said Bowers’ skills can help Canada in the tournament. Bowers scored 32 points in 40 games for Boston University last season. He is off to a slower start offensively this season, with five points in 13 games. However, Bowers believes he is better this year. “I am a year older, I am more mature, I think I am bigger, stronger and faster,” he said. Bowers participated in Hockey Canada’s World Junior Summer Showcase, a pre-world junior training camp in July and August. He thinks it will help him know the coaches’ expectations heading into the selection camp. McIsaac is a year younger than Bowers and has an advantage because no defencemen are returning this year and all roster spots are open. 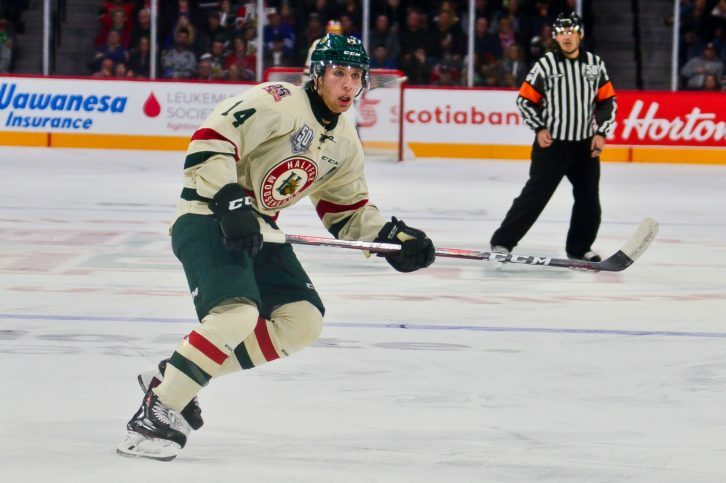 He is in his third year with the Halifax Mooseheads and is a Detroit Red Wings draft pick. McIsaac found out he was going to camp after a game in Rimouski, Que., on Sunday. McIsaac scored 47 points in 65 games last season and has 21 points in 20 games this season and has a lot of experience with Hockey Canada. He has also played at the Youth Olympics, the last two under-18 World Championships, the Hlinka Gretzky Cup and he was at Canada’s World Junior Showcase over the summer. During the four-day camp, McIsaac knows he doesn’t have time to ease into it. He needs to give his best showing every day in order to compete with the other players. “You have to go in ready, you can’t test the waters, you have to be ready to go,” said McIsaac. Sutherland said McIsaac is a defenceman who provides good offensive and defensive play. “I think he has rounded out his game where he is pretty dependable in all situations,” said Sutherland. If Bowers and McIsaac make the team, they will be the third Nova Scotians in the past two years to be on the world junior team. Drake Batherson from New Minas made the team last year and led the gold medal winning team with seven goals. “It maybe is a message to the young highly competitive kids at that young age having those goals and those aspirations, that it isn’t that far away and it is possible,” said Sutherland. The World Junior Championships start for Canada on Dec. 26 in Vancouver when the team plays Denmark.